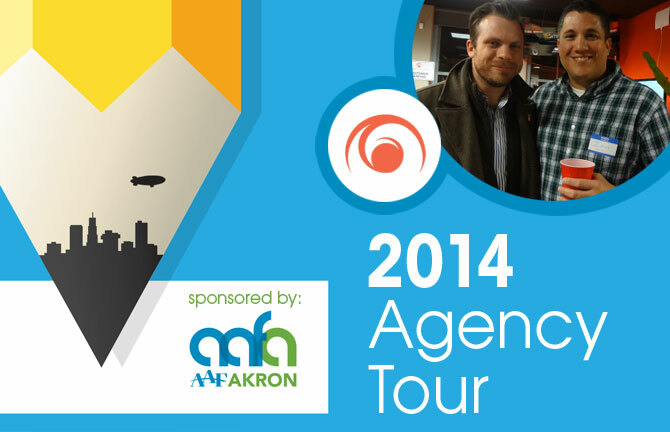 It’s hard to believe that a week has gone by since Array participated in the American Advertising Federation Akron Agency Tours. We had quite the turn out and met a lot of wonderful people. Our only regret was how quickly the time flew by! We definitely had a blast getting ready for the big day. The smell of the food being prepared filled the entire office and made it difficult to concentrate at times. If it wasn’t the food distracting us, it was the glare shinning off of our extra clean desks! Eric and I couldn’t be happier with the team’s effort in making the agency tour such a success. For those of you who attended, you know what a great group of people we have working here. Speaking of attendees, we met many students from local colleges, freelancers, other local agency professionals we’ve seen around town but never formally met, as well as a former professor with whom we reminisced. Everywhere you turned, there were interesting discussions taking place and many great questions being asked. It was fantastic to see the ambition the students exuded, the new contacts being made and the camaraderie among the local agencies. The evening left us feeling tired and energized all at the same time. We are already looking forward to next year! We would like to extend a big thank you to all who attended and to AAF for the opportunity to be a part of this community-building event. We would also like to give special thanks to TKM Printing Solutions for not only stopping by but also being there to help us with the finishing touches to our space (check out that process wall!!). If you weren’t able to attend the Open House and would still like to take a tour and/or learn more about Array Creative, contact our office at (330) 374-1960 to schedule a time to visit. Check out our “meet the team” and “team member bio” page on our website to learn more about us!